PDC multi-channel controller is a programmable analog or digital controllers designed to handle a large number of remote transmitters and perform a wide range of control functions. The micro-controller based circuit provides the user with an almost unlimited range of configuration possibilities including simple or complex zoning, changing alarm set points, time delays and relay addressing. The PDC controller can accept inputs from up to 8 analog transmitters or can handle up to 128 digital transmitters on a RS485 communication bus. Functions that can be set include relay assignment, time delays on make or break, complex zoning, sensor types and ranges, alarm set points and much more. 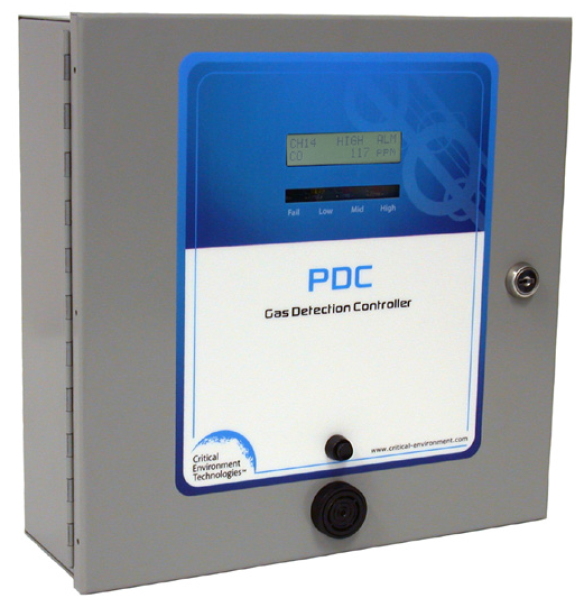 The controller has a two line backlit LCD display that actively scrolls through all programmed channels and displays the gas name, concentration and alarm status. The PDC features LED alarm indicators, audible alarm with silence button, and RoHS compliant circuit boards. Use with any CETCI analog transmitters, AST or LPT series, or digital transmitters, DST series. Each PDC is pre-programmed at the factory, and is completely field adjustable using a boardmounted push button keypad. Please contact EnviroMed for more information on this product.